Bread is a must on Italian tables. The ‘food of poor people’, as it used to be called: it was widely eaten because it was made with easily obtainable and cheap ingredients, available to all. Moreover, it could be made at home, following local recipes, often rooted in the history and traditions of each area. Today, more than 250 different types of bread are made all over the country, each and every region having its own traditional varieties. In the Northern part of the country soft wheat flour is more common, but in regions such as Lombardia you will find it mixed with rice flour or, in Emilia, with cornmeal. In the central region of Tuscany, you will find the famous pane sciocco, baked without salt: this is considered the best to eat with cold cuts, which are sometimes a little salty. Sardinia has its own bread, renowned all over Italy: pane carasau. It is also known as carta musica, music paper, because of the sound it makes when eating it, as it is very crunchy. In the South bread tradition turns mainly around durum wheat which is traditionally used for pasta. Several ingredients are often added to pane, such as olives and nuts or raisins, so that it can also be eaten for breakfast. Even if each region has its own specialty and variety of bread, there are some types you will find everywhere with common names. Ciabatta: Italian ciabatta bread. This is a classical type of bread you will find in almost every region. Ciabatta, slipper, is called so because of its shape which reminds that of a slipper: a “ciabatta” in Italian. Filoncino: long and soft, quite similar to baguette. It is often topped with sesame seeds or cereals. Focaccia: flat bread. Focaccia stands midway between bread and pizza. 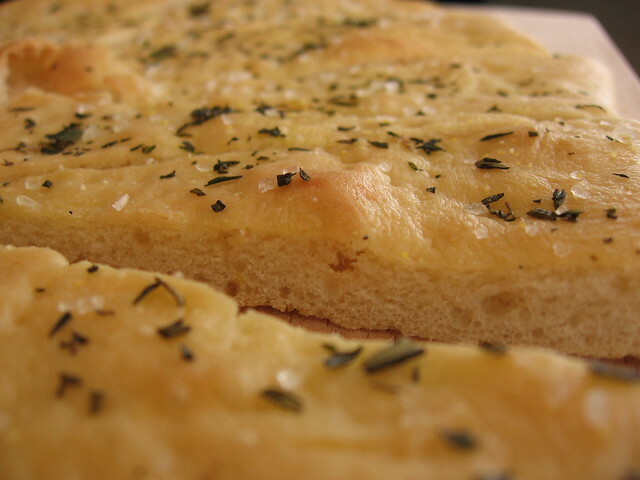 Depending on the region, you’ll have particular types of focaccia. Very famous are the focaccia ligure, with plenty of olive oil, sea salt and rosemary on top or the focaccia pugliese, made with potatoes. Freselle: this is not really bread, but rather a type of bakery item. Freselle are typical of the southern regions and in particular Campania, Apulia and Basilicata. Durum wheat is used to make this type of biscuit, which is cut into two pieces horizontally and cooked again. It is eaten a lot in the period of summer with tomatoes, basil and olive oil on top; some people also soak it into water before eating it in order to make it softer. Piadina: mentioned also in some Italian songs, this type of bread is typical of the area of Romagna. It is flat, made with wheat flour, olive oil, salt, water and lard. Everyone chooses the filling they like as there are plenty of combinations but several people like eating it with ham and cheese. Rosetta: this is one of the main protagonists in the category of buns and in some parts of the country it is also known as michetta. It is puffed and crunchy and its shape reminds that of a star with a swollen tip. Schiacciata or Schiaccia: it is a type of focaccia made in Tuscany, baked with olive oil and salt. Pane Cafone: it is a soft wheat, round-shaped type of bread typically made in Campania. Taralli: this is not bread, but it falls into the field of bakery. Its shape is similar to that of a ring and it is not risen. This product is made in the southern regions and in some areas of Lazio and several alternatives are baked, among which also a sweet version. Pane is sold at panetterie or forni, bakeries. Panetterie usually also sell typical cookies and cakes, and they are certainly more traditional than large-distribution supermarkets where you will not find the same smell and you will miss the opportunity to have a local experience. Italians eat bread with almost everything and every restaurant will always bring it to you at the beginning of your meal; if not so you can ask for it. People often make sandwiches but they also eat plain bread during lunch or dinner accompanying every single dish, except dessert or pasta, and you will always find someone being tempted by the idea of scarpetta, mopping up the plate with bread, which is an irresistible ritual for most.